What’s more fun to a child than playing near or in the water? But at the same time, what’s more terrifying to a parent? We all know that drowning is a very real danger to children, but we also want our kids to enjoy all the fun water activities available to them. The best way to ensure their safety is by having them wear a life jacket. Choosing one can be tricky, though. They’re bulky. They can be uncomfortable. Kids often refuse to wear them. 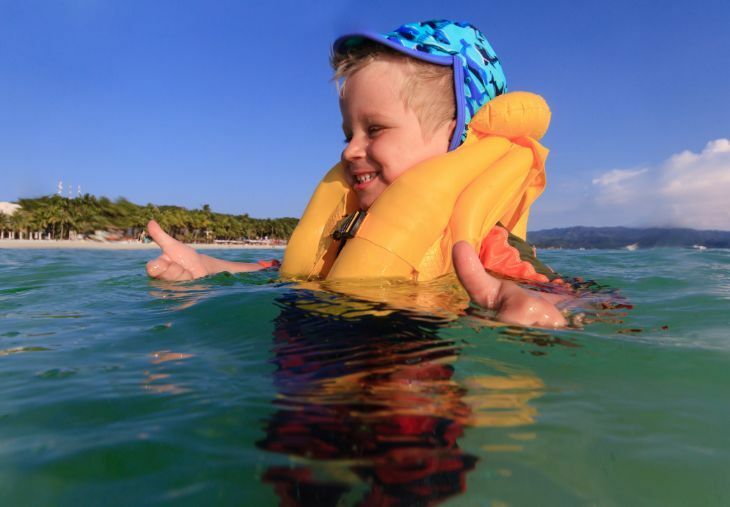 Here’s what you need to know about buying a life jacket for your kid — along with recommendations for the best, most comfortable ones that we’ve found. 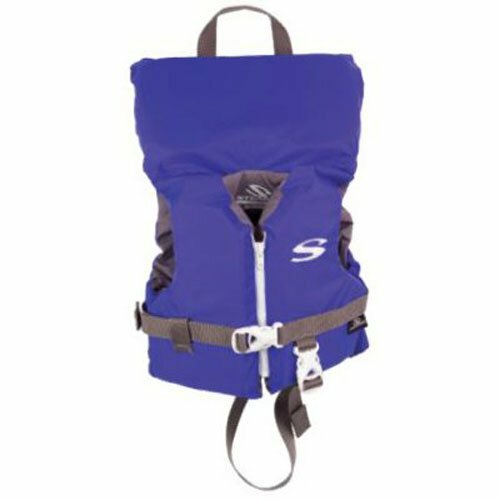 Use the links above to check the latest prices or read our in-depth baby life jacket reviews below. Drowning is the number one cause of accidental death in the world. Drowning deaths are most common among children aged 1-4, followed by children ages 5-9 (source). Combined with adequate adult supervision, wearing a life jacket while in or around the water is your child’s best protection against drowning. Even if your child knows how to swim, wearing a life vest while in a pool or boat is a good idea. If a child experiences fatigue without you noticing, a life jacket can prevent them from slipping beneath the water. And while boating, if an emergency were to happen and you or your child were to lose consciousness, a good flotation device can keep them safely afloat — and even flip them face-up depending on the jacket’s design — until help arrives. In addition to providing life-saving protection to your child, it’s also the law. The US Coast Guard requires that all children under the age of 13 wear a jacket if they’re on a boat that is underway (source). Individual state requirements may be more stringent, so you may want to check the law in your particular state. You can do that here. 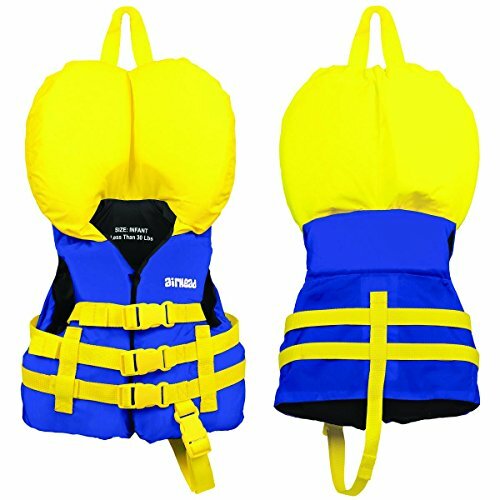 Finally, life jackets allow your child to experience all the fun and excitement the water has to offer so they can develop water confidence in a safe way. As your child grows and becomes old enough to learn to swim, you want them to be well-acquainted with water and to love it — not to be afraid of it. Wearing a life jacket in the early years will not only keep your child safe, but allow them to expand their horizons. Buoyancy: They’re filled with a very buoyant material (these days it’s usually foam) that displaces a large amount of water in relation to its size and weight (source), keeping the wearer afloat. Visibility: Depending on the color you choose, a life vest can keep your child visible in the event of an emergency. The top colors to choose include red, orange, and yellow (source). Stay away from blues, grays, and other dull colors. Head Protection: Some models are designed to flip children on their backs to keep their faces above water. These are ideal for infants or potentially dangerous water sports that could result in the user becoming unconscious and unable to flip over. 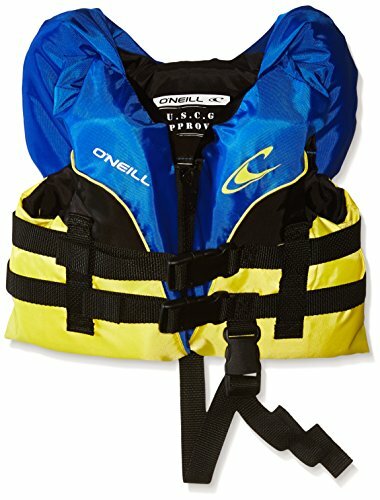 Security: Unlike unapproved flotation devices, most children’s life jackets come with a crotch strap to ensure they don’t slip off if a child falls in the water. Type I: These life jackets are intended for offshore ocean use, where the water tends to be rough and unpredictable. They’re very effective for flotation, but tend to be bulky and uncomfortable. It’s difficult to find Type I jackets for children. Type II: When purchasing a life jacket for your child, this is the type that you’re most likely to come across. Type IIs are designed for use in calmer water and used when boating or fishing. They’re less buoyant than Type I but also less bulky, making them more comfortable. They’re not suitable for rough waters. Type III: These are less buoyant than Type II. They’re most appropriate for well-supervised water activities where a rescue would be immediate, and they don’t flip the wearer on their back upon falling into the water. These are widely available in children’s sizes. Type IV: These are throwable devices (like life rings/life preservers) that are tossed into the water to a person in distress. They’re not appropriate to rely on for children as they’d need to tread water and swim before being able to access the thrown device. Type V: These are specialized jackets designed for very specific water use. If you’re casually shopping around for your child, you’re not likely to purchase a Type V.
US Coast Guard Approval: On the inside of any life jacket you choose, there should be an indicator that it’s approved for use by the US Coast Guard, and the conditions for which it is approved (recreational watercraft, personal watercraft, commercial use, etc.). Weight Restrictions: The weight limits are also printed on the inside. Choose one for the current weight of your child; don’t be tempted to buy one for larger children with the expectation that you can use it for longer. Safety is paramount, so the jacket must meet the immediate needs of your child. Color: If you’re planning to bring your child boating or out on the open water, visibility is critical for quick recovery in the event of an emergency. Choose brightly-colored jackets that contrast with the blue or green of the water. Orange, yellow, and red are good choices. Avoid grays and blues. Grab Strap: A grab strap is a good safety feature if you’re planning to go boating. It provides a handle that you can grab and easily pull the child back into the boat if they fall into the water. Security: The life jacket you choose should be secure. Some provide a crotch strap, which runs between the legs so the jacket can’t slip over your child’s head. If it doesn’t have a strap you can test its security by picking your child up from the jacket’s shoulders; if it doesn’t come up above their ears, it’s snug enough. Life jackets are manufactured to keep your baby safe in the water, but they only work if they fit properly. “Infant” life vests are rated for babies from 8-30 pounds, which is a huge size range that could make it difficult to find one for the smallest of babies. Babies vary widely in size, but some are well over a year before they reach the 18-pound mark. If you plan on taking your small baby on a boat, make sure you test your life jacket (or PFD, Personal Flotation Device) per the Coast Guard recommendations. As a parent, you probably wish you could always be there to scoop your little one out of possible danger. But accidents can and do happen, and a flotation jacket can step in at just the right moment to save your child from a potential disaster. Here are 5 products we think you can feel confident relying on during an emergency. It's incredibly dangerous for your child to inhale water. 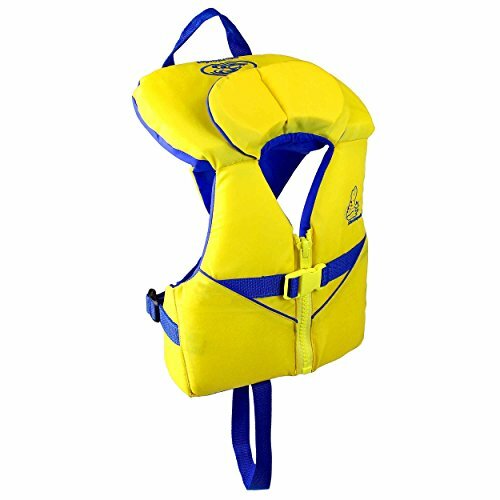 Choose a life jacket that has extra foam head panels, and not only will they provide support, but they'll also help to flip your baby over once they’re in the water. So if the worst does happen, your little one will be face-up and able to breathe safely. This model doesn’t have just one foam neck support — it’s got two. Stohlquist improved on the foam flap design by adding an additional foam pad for extra support for babies on the smaller side. It has both an easy-to-use zipper and a buckle with adjustable strap for added security, along with a crotch strap to prevent it from slipping over your baby’s head. The design is much less bulky than many others out there, while still offering high-quality, Coast Guard-approved protection. It’s available in bright yellow. It has dual neck support to keep your child’s face out of the water. It has both a buckle and a strap for a snug fit. The grab strap is strong and easy to get to. The zipper can rub on baby’s neck or face. You want your little one to feel comfortable in the water, but you also want them to be safe. Choose a Type II flotation device for use in or around the pool. Not only will it keep them afloat while they’re splashing around, but if they slip and fall in, it'll automatically turn your child face-up to prevent drowning. This snug-fitting device has a back-zipper enclosure along with a neoprene body to keep it much more trim than your typical life jacket, making it perfect for splashing in the pool. 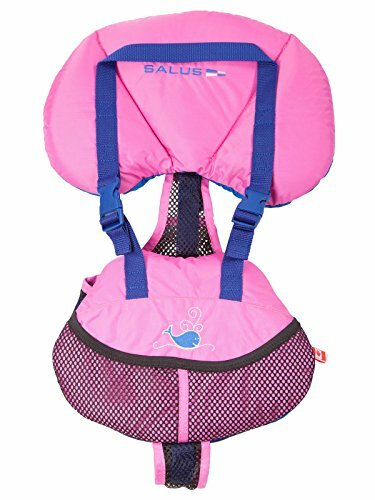 The neck flap is designed to keep your child’s head above water in the event they fall in, and dual crotch straps keep the jacket secure without giving them a wedgie. This is bright yellow, so if you decide to go on a boat, visibility will be excellent. And since it’s Type II Coast Guard approved, you’ll be legal. It’s far less bulky than other models. It has a sturdy grab strap. It will flip your baby onto their backs. The neck hole is a little small. Not expandable (zipper enclosure vs. adjustable buckles). If you’re going offshore, it’s recommended that you have a Type 1 flotation device. The bad news is that these aren’t widely available for purchase in small children’s sizes. So use extreme caution if you’re planning an excursion into rough ocean waters and look into commercial-grade options. If you’re staying close to shore in calm waters, go for a highly-rated Type II device that’s brightly colored and easy to spot in the water in case of emergency. If you’re taking your little one out into the open ocean, safety is crucial. 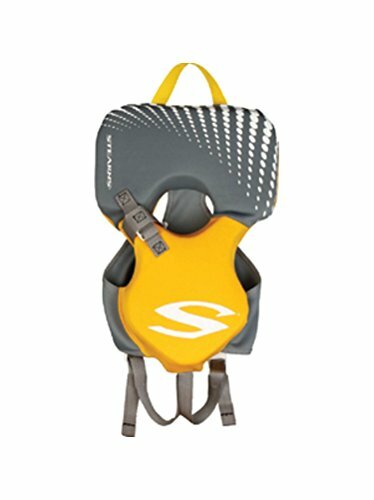 This life vest will quickly flip your baby on their back and keep their face out of the water, preventing them from drowning if there’s an accident. And between the bright yellow color and the attached grab strap, they’ll be located and pulled from the water quickly. Reviewers agree that their babies found this to be comfortable, and the crotch strap keeps them safe and secure. And with the dual-fasten zipper and adjustable buckle, you’ll be able to customize the size and get the life jacket as snug — and safe — as possible. Brightly colored for easy recovery. Crotch strap prevents slipping overhead. Designed to facilitate face-up flotation. Not Type I (recommended for offshore boating). Suitable for up to 30 pounds only; you’ll need to upsize when toddler grows. For boating, the US Coast Guard recommends a Type II jacket for infants (source). However, finding one is easier said than done. Many aren’t manufactured for babies less than 30 pounds, and even when they are, it can be hard to find one that fits properly. When selecting one for your small baby, make sure you’re paying extra-close attention to the weight limits on the label and test it out in a pool before heading out on a boat. This vest from Airhead is rated for infants under 30 pounds, and comes with adjustable buckle straps so you can tighten it to make it snug. The accessible grab strap means you can haul your child from the water quickly and easily, and the foam collar offers additional head and neck support for your baby — both in and out of the water. When buying this model, there are options to purchase ones with cute cartoons and designs, but don’t let cuteness win over safety — the yellow is still best for visibility. It has adjustable straps to tailor the fit. It’s brightly colored so you’ll have no trouble spotting your child. It has a grab strap for a quick rescue. Will not fit very tiny babies. It’s bulky, which means your kid may hate wearing it. If your little one is just getting the hang of swimming, you want buoyancy to keep their head afloat without the bulk that will restrict their movement. You also want a life jacket that won’t keep their entire torso sitting above the water, which won’t allow them to get the feel of lifting it up on their own. If you’ve ever had a child refuse to put on their life jacket because it was bulky and uncomfortable, you might want to try a Puddle Jumper. Even though it looks nothing like a traditional life jacket, it’s still US Coast Guard approved (Type V with type III performance) and is secure because it wraps around both the upper arm and around the torso. This option will keep your budding swimmer’s head well above water while keeping their torso unencumbered. They’ll be able to freely move their arms and legs to practice their swimming stroke, but still be able to feel what it’s like to raise their torso to the top of the water on their own. It’s comfortable for children to wear, so they won’t fight you to wear it. It will not float the torso so the child can maintain a natural swimming position. It’s not appropriate for babies under 30 pounds. You want your baby to cool off on hot summer days by getting into the water, but a bulky, plastic life jacket can actually cause them a lot of discomfort when it’s very hot. If you want to keep your baby safe, but plan on having them in the sand for most of the day, this life jacket will help keep them cool. It features an adjustable mesh and webbing harness system to improve air circulation and keep heavy plastic fabrics from rubbing against the skin. The mesh back specifically allows your child to lay comfortably on a blanket or even in a baby carrier. It’s designed for babies between 9 and 25 pounds and has a three-piece collar design with additional flotation to help cradle your baby’s head. If you love to hit the beach with your baby for extended periods, this life jacket will help keep them safe and cool. Mesh and webbing harness keeps your baby cool on the hottest days. Additional flotation near the head is extra comfy. It may take moms some getting used to when it comes to getting the mesh harness on correctly. When it comes to life jackets, sometimes simple is best. This one has a classic vest design and includes a number of features that makes it ideal for infants. If your little swimmer is just starting out, this is an affordable and sure choice. With a durable nylon shell and PE flotation foam on the inside, this US Coast Guard-approved jacket helps infants under 30 pounds stay afloat. There’s even a leg strap and grab handle for extra security. If your little one has a scary moment in the water, you can grab them right out without worrying about anything breaking or slipping. We also approve of the head support, which contains flotation foam, too. This can give your baby confidence and help them feel more comfortable in the water. If you’re looking to start swim lessons with your little ones, this is a great choice that will last for years to come. US Coast Guard-approved with nylon shell and flotation foam. Simple and classic vest design is easy to take on and off. Grab handle lets you pull baby right out of the water in emergencies. Sizing can be tricky, so make sure the life jacket isn’t too tight or too loose. While I love the comfort and design of the Puddle Jumper, overall safety wins out, making my top pick theStohlquist Unisex. It’s US Coast Guard approved with all the safety features you’d want — neck support, crotch straps, grab strap, and bright color — all wrapped up in a sleek, non-bulky design. And not only is it safe, but it’s more comfortable than many of the other options. There are lots of flashy and adorable life jackets on the market today, but don’t let them distract you from the essential safety features you need. Because in the event of an emergency, that’s all that matters. Stearns puddle jumper vest is NOT a type III USCG approved vest. It is “USCG approved type V with type III performance”. This wording is on the vest and on the Amazon website. If it was a III it would be approved as a III.